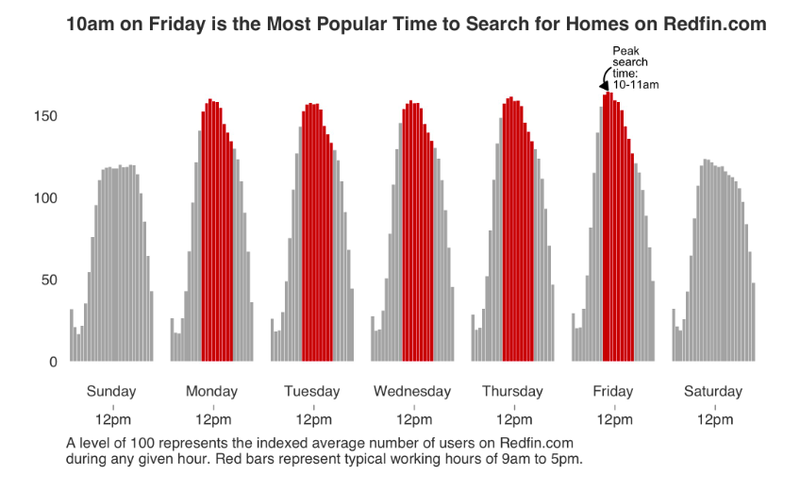 Redfin.com experiences a 64 percent spike in user search activity on Fridays at 10 a.m., making it the most popular time to look at listings. The second most popular time is Mondays at 11 a.m. when user search activity increases by 61 percent. Overall, Redfin says, buyers tend to search during the workday (tsk-tsk) more than any other time of the week, with weekday evenings being the most unpopular. Wednesdays at 9 p.m. is the most unpopular time for user search activity (-7.4%), and during the weekends (6 p.m. on Friday and 7 a.m. on Monday) the site only experiences a 22.4 percent rise in activity — a far cry from the 64 percent spike seen on Friday morning. Zillow highlighted the importance of online search tools in its 2018 Consumer Housing Trends Report, noting that 79 percent of all buyers use sites such as Redfin, Zillow, and Trulia to find the perfect abode. The average buyer spends 4.4 months searching before making a purchase, and relies on these sites to find comprehensive data about the home and its history (59%), an agent or broker’s evaluation of the home (47%) and pictures of the home (46%).